Smooth dark chocolate enrobed with crunchy white candy and filled with lemoncello and sugar crystals. You might think it is a little funny to be writing about wedding almonds, but these were simply too delicious not to write about. Wedding almonds, also known as confetti, are traditionally given to guests at Italian and Greek weddings. 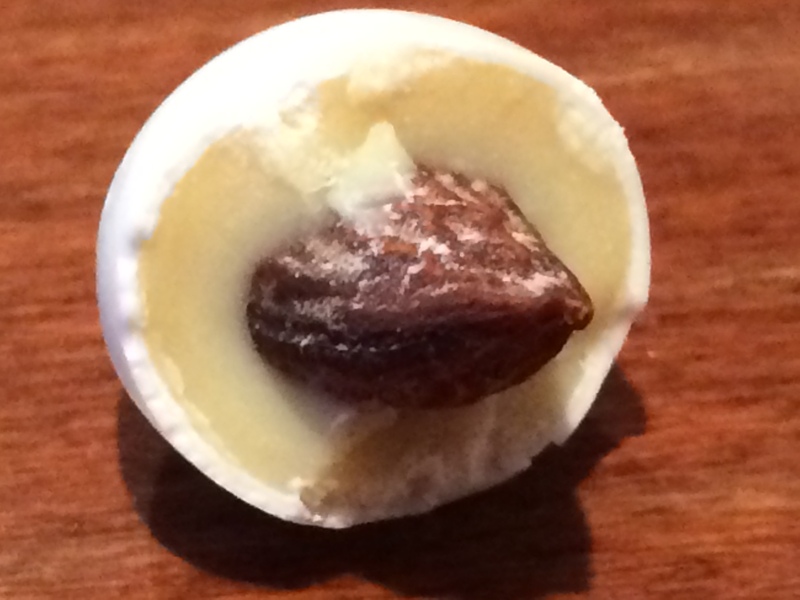 The fresh almonds in the center have a slightly bitter taste, which is covered by a sweet coating of sugary white candy. This is symbolic, as it is the hope that some of life’s bitterness will be masked by the sweetness of their union. At a typical Italian wedding, every guest is sent home with 5 wedding almonds in a fancy little bag. The five almonds are meant to represent five wishes for the new couple: health, wealth, happiness, fertility, and longevity. After spending nearly 6 hours eating course after amazing course of incredible food at our friends’ wedding in Tuscany, we went into the dance hall where the cake was about to be cut. In the center of a long table stood a beautiful wedding cake surrounded by a smorgasbord of enticing desserts that I could only look at helplessly because my stomach was already full well beyond capacity. I scanned the room quickly with the intention of narrowing down what I might reasonably be able to fit in my stomach. Alongside tiramisu, panna cotta, cakes, and an overwhelming amount of both Italian and Persian sweets stood a rather elaborate display of wedding almonds. Editing those out was a no-brainer for me; I have never much cared for wedding almonds, and I had no intention of wasting valuable stomach space when so many other incredible-looking things were on offer. But my husband was so excited about the wedding almonds that he practically dragged me over to the confetti display insisting that I should just taste them. I took a bite of a coconut one, finished it, and moved on to taste a tiramisu one. These were amazing. I tasted the pear and ricotta one, and suddenly I was not feeling so full after all. The flavors were almost abnormally complex. All of them were delicious, but the dark chocolate with lemoncello was by far my favourite. It was also the only flavour that did not actually have an almond in the middle. 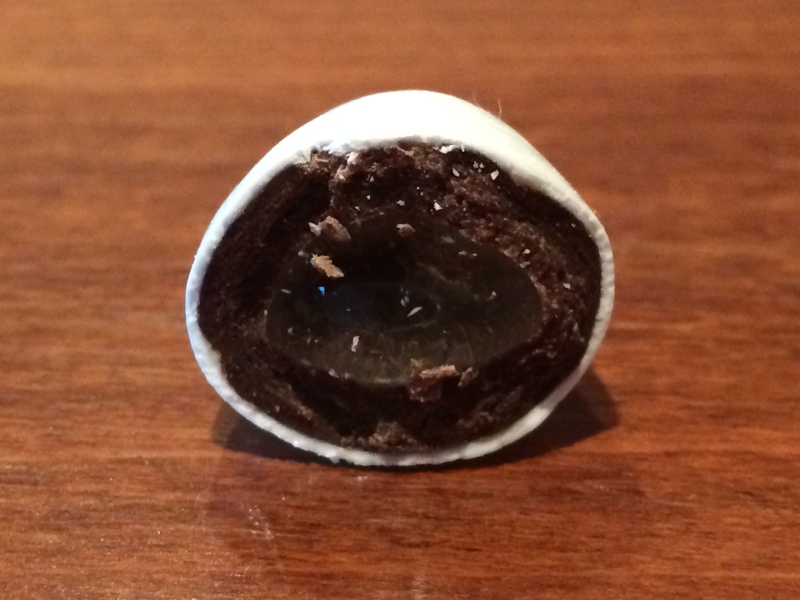 Instead the traditional white candy coating was filled with smooth dark chocolate, and the space where the almond would normally be was filled with sugar and lemoncello. The combination was crunchy, creamy, boozy, sugary, and chocolately all at once. The moral of this story is that if you happen to be at an Italian wedding, please do not write off the confetti without tasting it first! I have never been much for wedding almonds, but it turns out that all wedding confetti is not created equal. Lucky for me the bride and groom were aware of my obsession and gave me a nice bag of them to take home with me. Yummy!! wow–who knew? Those are crazy–so very Italian 🙂 Were they going above and beyond, or do many Italian weddings offer assorted flavors of candied almonds? The dessert buffet sounds phenomenal. Hope there was lots of dancing you could move some of the sugar around! Love that you had such an amazing trip.